Thank you to IZ5RZR for writing in and sharing his two SatNOGS rotator builds with us. SatNOGS is an open source project that aims to make it easy for volunteers to build and run RTL-SDR or other SDR based RF ground stations that automatically monitor satellites, and upload that data to the internet for public access. IZ5RZR writes that he's now made two rotators and one was modified to use a 5:18 stepper motor (which is upgradable to 50:1) to give more torque so that heavier antennas can be turned smoothly. His rotators are powered by a 12V battery charged by solar, and they can be controlled over WiFi with a PC/tablet/phone. He's also tested the rotators with a 24 dB parabolic grid antenna and found that the rotator could handle it even without a counterweight. He also notes that together with IK5XWA they've fixed a "Meridian Flip" bug in the firmware. The video below shows the two rotators in action. GNU Radio is a very powerful open source platform for implementing various digital signal processing (DSP) algorithms. It is very commonly used with software defined radios like the RTL-SDR, as well as much higher end units. The community that uses GNU Radio is very large, and so every year they hold a conference that highlights some of the most interesting applications and developments related to GNU Radio. The 2018 GNU Radio conference was held in Las Vegas during September 2018. Recently they have uploaded the talks to YouTube, and below we're posting some of our favorites. The full list can be found on their YouTube channel. In this keynote talk Manolis Surligas discusses the SatNOGs project. SatNOGs is a non-profit organization creating an open source and volunteer based satellite ground station network. John L. Makous discusses his work in creating low cost and home made horn antenna radio telescopes designed to receive the 21cm hydrogen line and other astronomical objects and phenomena. The idea is to provide a low cost solution and easy to build telescope to use in schools. Nate Temple gives us an overview of several signals that have been decoded with GNU Radio flowgraphs. Juha Vierinen discusses using a USRP to measure propagation conditions with ionospheric chip sounders, and improvements to chirp sounders by using spread spectrum noise. He also discusses various other radar techniques and applications. SatNOGS is an open source project that aims to make it easy for volunteers to build and run RTL-SDR or other SDR based RF ground stations that automatically monitor satellites, and upload that data to the internet for public access. 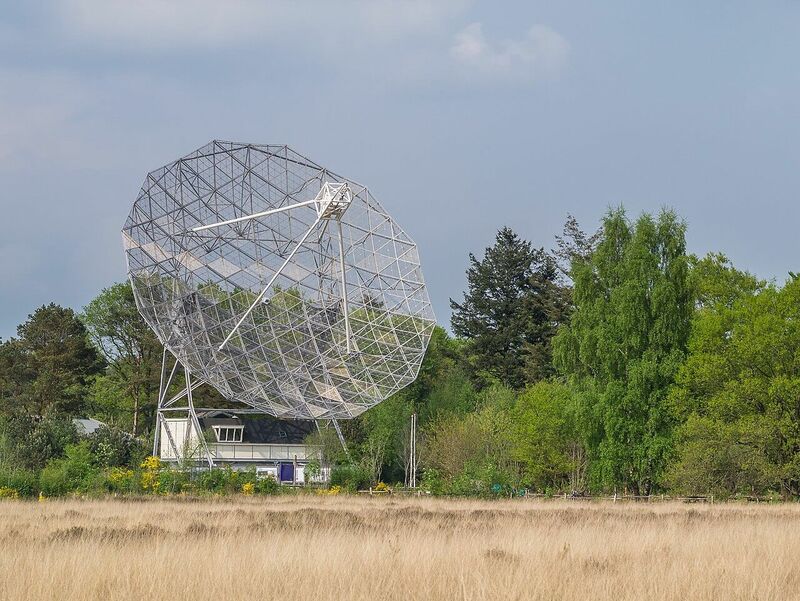 The antennas used in a typical home based SatNOGS station are small enough for a single person to handle, however recently the SatNOGS team have been working on setting up a monitoring station at the Dwingeloo Radio Observatory in the Netherlands. This week the Dwingelooradio Observatory tested their 25 meter dish as a SatNOGS station! Although not set up as a permanent SatNOGS station it is great to see this historic observatory linked to the network. Dwingeloo radio observatory was built between 1954 and 1956 near the village of Dwingeloo in the Netherlands. Since 2009 this single 25 meter dish has been a national heritage site. One of the piezo speakers playing the satellite transmissions. In the past we've seen software defined radio's like the HackRF use to create art installations such as the 'Holypager', which was an art project that aimed to draw attention to the breach of privacy caused by pagers used by doctors and staff at hospitals. 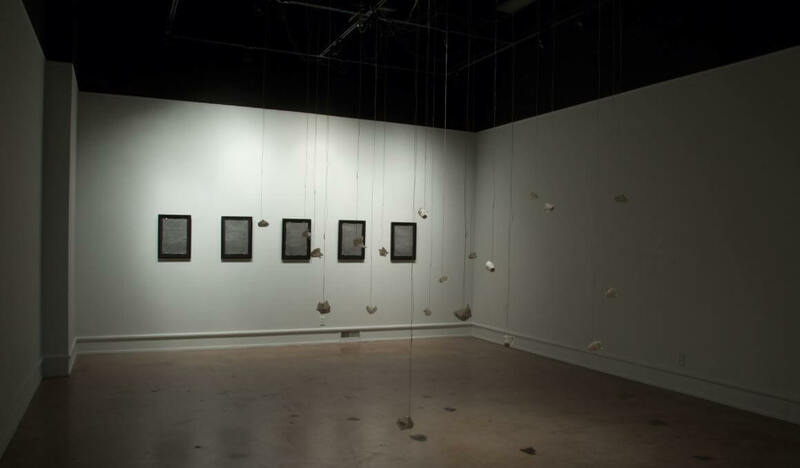 This 20-channel sound installation represents the results of collecting hundreds of transmissions from satellites orbiting the earth. Using custom antennas that I built from scratch, I tracked the orbits and frequencies of satellites using specialized software. This software then allows me to collect the radio frequency signals and translate them into sound. The open source software and hardware, called SatNOGS and developed by a world-wide group of satellite enthusiasts, enables anyone to build a ground station for tracking satellites and their transmissions, which are then uploaded to a publicly accessable database. Data received by my ground stations can be found here. These transmissions are mostly from weather satellites, CubeSats (small satellites launched by universities world-wide for short-term research), or amateur radio repeaters (satellites designed for ham radio operators to experiment with communication over long distances). 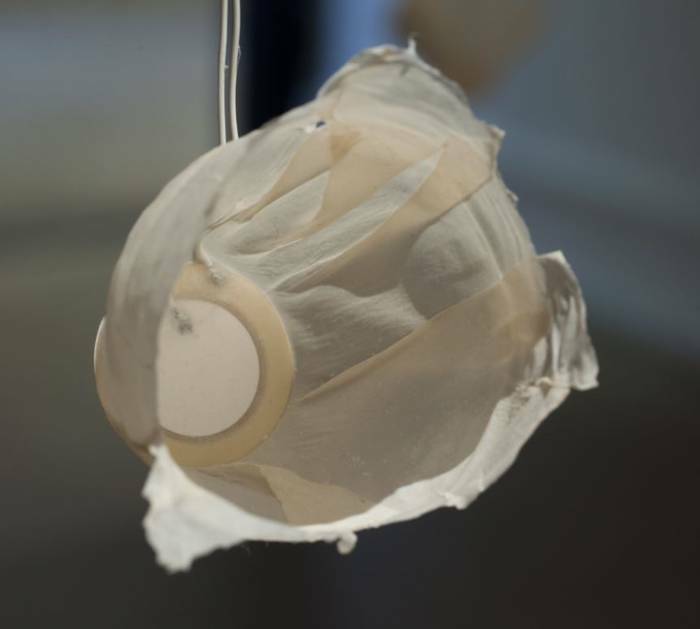 I made the speakers hanging from the grid from a piezoelectric element embedded between two sheets of handmade abaca paper that was then air dried over a form. The project was also discussed over on the SatNOGS forum. Over on his YouTube channel Tysonpower a.k.a Manuel has uploaded a video showing a demonstration of his home made antenna rotator. 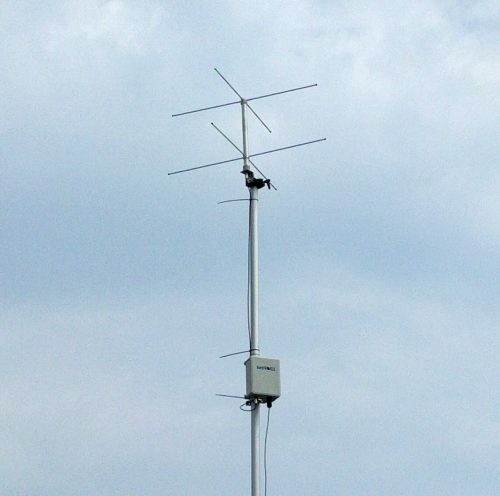 Manuel has also created a blog post about his antenna rotator, which includes a full parts list and a link to all the files. An antenna rotator can be used to automatically point a high gain directional antenna such as a Yagi at a low earth orbit satellite which passes overhead relatively quickly. Such as antenna can be easily connected to an SDR like the RTL-SDR to receive data such as HRPT weather satellite images from satellites. Manuel's antenna tracker is inspired by the SatNOGs rotator, but he writes that his one was designed to slightly to be smaller and more powerful. For the driving motors he uses NEMA23 steppers which are mounted in a frame made out of 2020 aluminum extrusions. An Arduino Nano with optical end stops controls two TB6600 stepper drivers which control the motors. The rest of the parts such as brackets and gears are all 3D printed. Attached to the antenna rotator is Manuel's home made carbon Yagi antenna. He also attempted to use his 1.2m dish but found that the rotator could not handle the weight. Thank you to Silvia P. for writing in and letting up know about the SatNOGs “No-Rotator” project, which looks a lot easier to build compared to their motorized rotator. SatNOGs is an idea and organisation that is trying to make it easier to set up a low cost networked RF ground stations for monitoring various satellites. 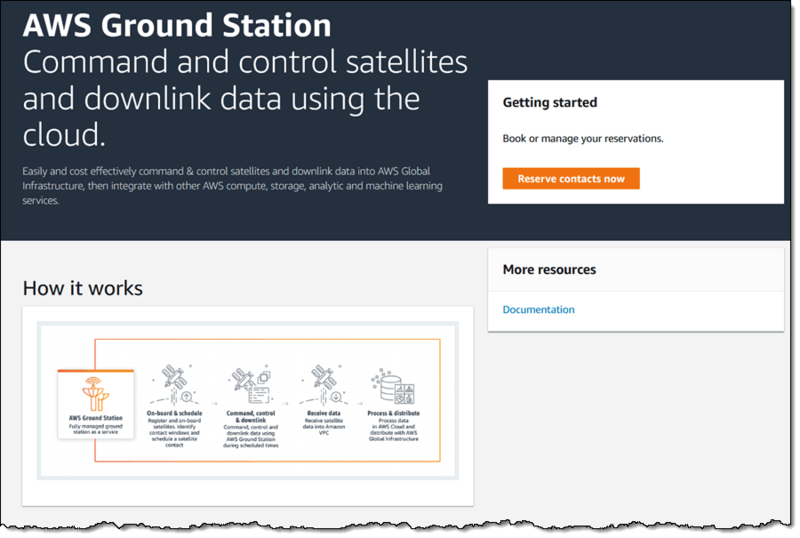 The idea is to increase satellite ground station coverage all over the world and collect and share received satellite data over the internet so that anyone in the world can view and make use of up to date satellite data. An original SatNOGs station is built as a motorized antenna rotator, with directional antennas that point and track satellites as they pass over the ground station location. The gears and most internal plastic parts are 3D printed, with the rest of the items like bearings, frames and motors being available on eBay. The problem is that building the rotator is quite a big project, and takes a lot of research, purchasing and building to get started. Recently over on their Wiki a new type of non-rotator ground station has appeared. The no-rotator ground station still consists of the basic SatNOGs electronics including an RTL-SDR and Raspberry Pi. But instead of using high gain directional motorized antennas this ground station uses a much simpler turnstile antenna tuned to about 137 MHz. Unlike the rotator, the turnstile probably doesn’t have enough gain to pick up some of the weaker amateur satellites, but should be good enough for NOAA/Meteor weather satellites and ISS APRS etc. We’ve also recently seen similar no-rotator builds discussed over on their forums and on Twitter.